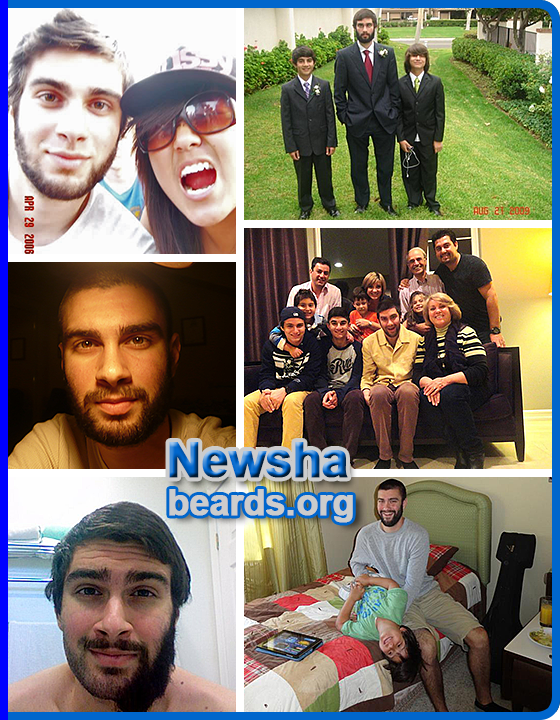 All about beards is pleased and proud to add Newsha to our featured beards section. 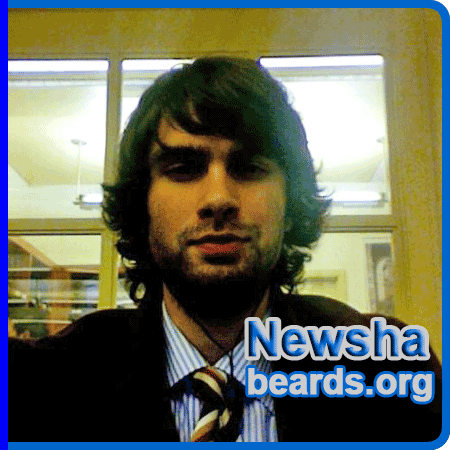 Newsha first appeared in our beards of the world gallery as a teen back in 2007. 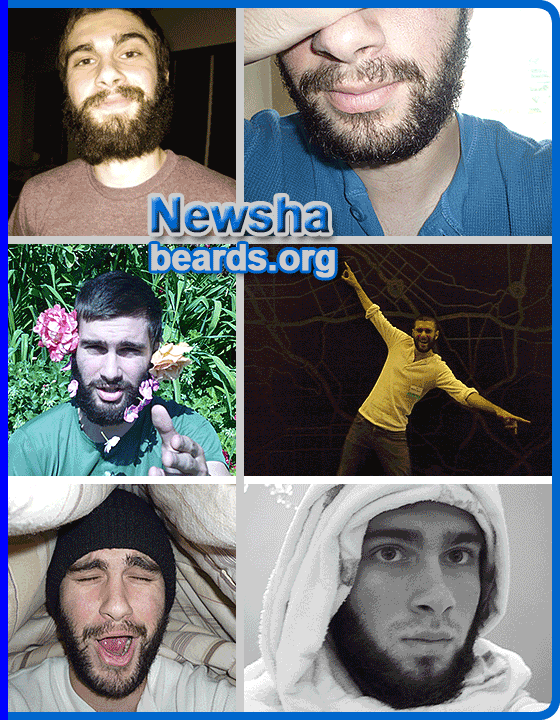 In Newsha’s beard feature we can see the impressive transformation of his beard since 2007. Along the way, Newsha has always maintained a steadfast dedication to the beard even though he was pressured to shave it now and then. He’s always gone back to the beard, never being without it for long. Newsha’s dedication to the beard is all the more impressive considering that he started so young. My name is Newsha. I am a beardist. Beard growth has rewarded me with more tolerance than I ever would have imagined. Born into a conservative Iranian family and raised as an open-minded American, my moral upbringing was toppled with turbulence; in one hand, my parents advocated freedom of choice, while in the other, they overlooked my daily life on a micro level. At around eighteen, I decided to retaliate with a six-month facial hair project. Through this, I wanted to challenge preconceived notions about facial hair and carry out the respect and admiration that beards deserved. Times have changed, and so has my family’s tolerance with facial hair. It was during the Iranian Revolution that my parents had fled for America where they eventually abandoned all ties with Iranian politicians, including the infamous beards they wore. 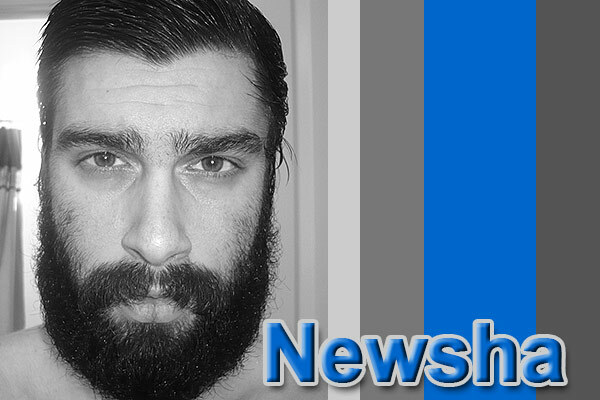 As a result, the idea of having their Iranian-American child growing a beard seemed culturally and socially offensive. At times, they were dispiriting, often comparing me to that of their pre-American leaders. Yet, as time grew, so did their admiration to this cause. Although my father had once attempted to bribe me out of it altogether, I reminded him that my intentions were strong and immovable. I now stand as a permanent beard grower to this day. In fact, these former paragraphs are what I used as my essay prompt for entry into UCLA. Yes, a university entry essay about beards. Anything is possible with enough love and patience. I get called a myriad of names: Jesus, Bin Laden, Santa, and Moses. Still waiting on Socrates or Darwin. The girls love it and so do dudes. I find myself explaining why I have one in the first place and usually make a rebuttal with a history lesson. Alexander the Great popularized clean-shaven beards after his invasion over the Persians. In fact, had he instead lost, us bearded minorities would be the majority today. 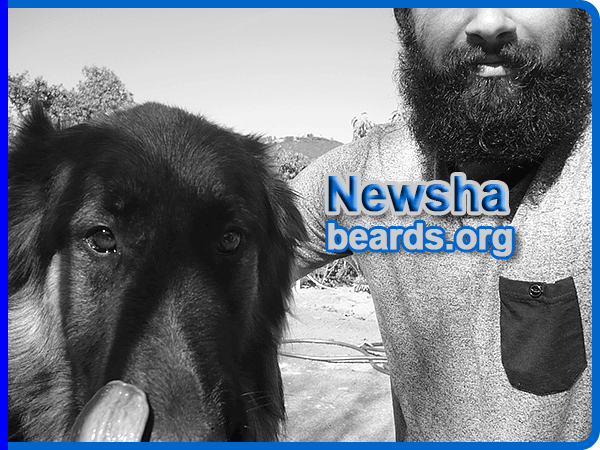 Now scroll on down to read Newsha’s beard interview. Then, be sure to visit Newsha’s photo album. to his beard feature’s album. All photos are subject to the site’s conditions of use. What do you think about beards? Beards are a homage to what makes man, well, a man. They symbolize patience in the face of societal pressures. Beards also suggest you’re not a person to be messed with. Why do you grow your beard now? I feel more comfortable with it than without. I’ve grown to love it over the years. What does your beard mean to you? Confidence, lone wolf, independent-thinker. One who can take opinions and formulate his own at the same time. You have expressed some succinct, yet deep thoughts about your beard over the years. What do you think today of the importance of your beard and beards in general? Beards are the underdogs of men. They define the alphas from the beta. Sexual selection also favors, to some extent, facial hair. Clean-shaven faces, in my opinion, suggest a certain level of social subservience. Be who you want to be. Embrace your testosterone! I stand alone. I carry a certain level of wisdom and sexual virility. Did anyone in your family have a beard when you were growing up? Do you remember having any thoughts about beards before you were old enough to grow one? As a kid, I took a liking to Shel Silverstein’s works and his beard as well. This liking then expanded to Darwin in later years. You were pretty young to start growing your beard. At what age did you grow your first beard? I’ve always been littered with hair. From fourth-grade unibrow to ninth-grade facial patches. By tenth grade I was in…for good. How did you decide to grow your first beard? Grow for a month and shave the neckbeard after. Do you feel it took some courage to grow your first beard? No, it simply came into fruition. What was it like seeing yourself with a beard for the first time? Wow, I look like a better me. What happened to your first beard? Went down the drain because I had a job at an ice cream parlor. How long was it before you grew another beard? Right after, which directly nullifies my answer to the previous question. What brought you back to the beard? The fact that I could. I am genetically blessed (no patches, irregular mustache-to-beard ratio). May as well flaunt this biological energy in a masculine way. Did having a beard set you apart from most of your peers? I would like to say no. I didn’t think much of it. I’m sure I looked a bit older, but nothing from the ordinary. What was that like? I scored beer as an underage without getting carded. Were you known as the guy with the beard? Probably today that is true, but not in my younger years. Because you were so young, would it be fair to say that you were a “boy with a beard” in your early beard-growing years? Yes, in middle school and high school I felt mentally older than my chronology. How did your parents deal with your beard? They sometimes bribe, other times poke fun at. Over the years, you have identified yourself as an experimental beard grower, an occasional or seasonal beard grower, and a dedicated, permanent beard grower. How did these status changes happen? Over the years I have evolved into a permanent beard grower. The status changed because I honestly stopped caring. I was going to be me BY me, not through others. What role did beards.org play in your beard-growing efforts? Brought me a community of like-minded individuals. Do you think you were a trailblazer for beards in your age group? Sometimes I inspire random people. They admire the patience because they often fall victim to impulse. Do you feel that your beard sets you apart today? Probably. I know it’s really big, but I don’t think of it much nowadays. You have grown the full beard. Why did you choose the full beard? Mustaches just aren’t my thing, and believe me, I’ve tried. I’ve tried sideburns as well. I always go back to beards because of the overall quality feel. In your first beard photo on beards.org, you had the chin curtain beard. Have you tried any other beard styles? Yeah, biology-professor goatee, Van Dyke, mutton chops, and they all lasted less than a day. How do you feel about or how do you view the difference in your beard of today versus your early beards? Every time I grow a new beard, I’m more satisfied than before. I think beard growth is a gradual process with its ups and downs. Some find their niche in anything from mustaches to mutton chops. I tinkered with various styles throughout the years until I finally settled down with a full beard. I love the full beard. I wouldn’t have it any other way now. Click on the image below to go to Newsha’s photo album.